From products made at farms to stem cell technology, there’s a bumper crop of innovations to help you look your best. From products made at farms to stemÂ cell technology, thereâs a bumper crop of innovations to help you look your best. But a growing number of meat eaters are also intrigued, now that vegan makeup, skin-care and hair-care items are popping up in mainstream drugstores and giants like Sephora. They tend to cost a bit more, though, so why try them? Vegan products typically contain fewer chemicals, so theyâre good for those who areÂ cautious about what they put on their skin. Our picks: (1) The Gnarly Whale Sudsy Shampoo, $17; thegnarlywhale.com. (2) Drunk Elephant TLC Framboos Glycolic Night Serum, $90; sephora.com. (3) Ella+Mila Nail Polish, $7 each; amazon.com. Perhaps youâve been to one of those trendy restaurants touting farm-to-table dishes that are minimally treated and processed. Thatâs the concept behind some of the latest skin treatments and cosmetics made with good-for-you ingredients, like aloe vera and flower-based essential oils, that are usually organic. Theyâre whipped up in small batches (typically at local farms or indie labs), without the usual stabilizers or preservatives. âBecause these products are minimally processed, using only natural methods, theyâre a great option for women with sensitive skin and those who are allergic to artificial fragrances and certain chemicals,â says Jessica Wu, MD, a Los Angeles dermatologist and assistant clinical professor of dermatology at the Keck School of Medicine of USC. Buying these is also a way to support women-run businesses (as many farm-to-face companies are) and even do social good. The less-is-more approach of these treats does come with a caveat: Products made with fresh ingredients and no preservatives tend to spoil faster (on average, they last about half the time of others), so check the expiration date and keep an eye out for changes in color or scentâsigns you should ditch âem. Our picks: (4) Farmaesthetics Herbal Hydration Complex Remedy Reserve Mask, $34; amazon.com. 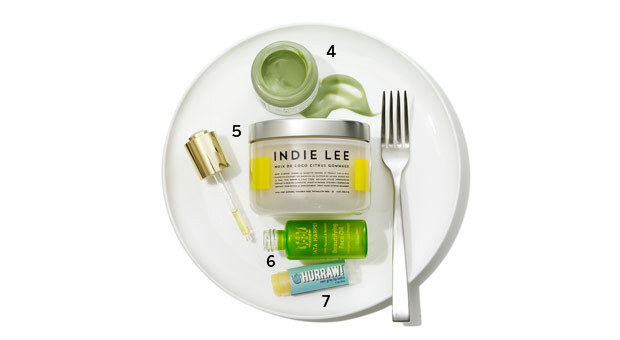 (5) Indie Lee Coconut Citrus Body Scrub, $38; indielee.com. (6) Tata Harper Beautifying Face Oil, $48; tataharperskincare.com. (7) Hurraw Balm, $4; hurrawbalm.com. Apples are also being tapped for their beautifying benefitsâcredit the vitamin C and enzymes. Another edible thatâs ripening up beauty products: tomatoes, which are loaded with lycopene, an antioxidant that can protect skin from environmental havoc (including damage from pollution and UV rays) and lighten age spots. âThe lycopene that exists in fruits and vegetables neutralizes free radicals from light when theyâre growing, so it makes sense that itâs now being used to treat sun damage and excess pigmentation,â says Whitney Bowe, MD, a dermatologist in Briarcliff Manor, New York. Plus, lycopene has been shown to increase the production of collagen. 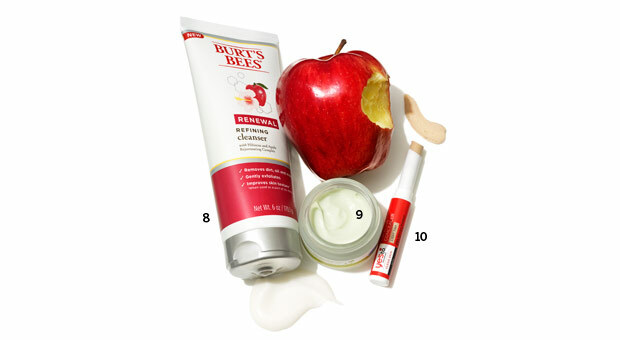 Our picks:Â (8) Burtâs Bees Renewal Refining Cleanser (which contains apple), $10; amazon.com. (9) MyChelle Pumpkin Renew Cream, $28; amazon.com. (10) Yes to Tomatoes Clear Concealer Stick, $10; target.com. Stem cells have been making headlines for years, showing promise for a slew of medical treatmentsâfrom developing tissue for damaged organs to helping to cure drug-resistant diseases. Now a study published in the International Journal for Applied Science finds that stem cells in plant tissue may offer beauty benefits. âBecause these cells contain a concentration of antioxidants thatâs much greater than that of other botanical extracts, they can accelerate collagen production and cell renewal in your skin to decrease the signs of aging,â says Karen Kim, MD, a dermatologist in Chestnut Hill, Mass. Look for grapeseed, raspberries and algae onÂ labels, since they pack high doses of stem cells. Serum, $42; amazon.com. (12)Â EmerginC Scientific Organics Grape Stem Cell, White Tea + Seaweed Body Butter, $45; amazon.com. 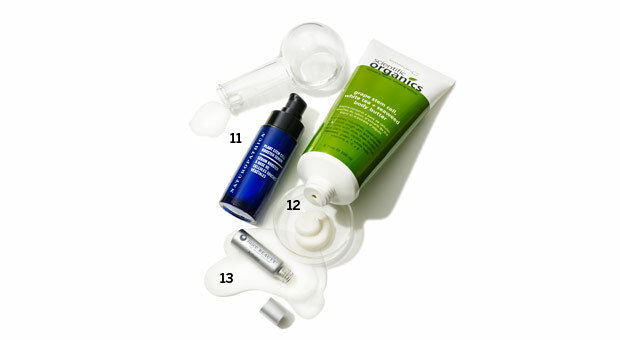 (13) Juice Beauty StemÂ Cellular Instant Eye Lift Algae Mask, $75; amazon.com.